**** Chosen by Winner: David D.
This design is the first from ABS Master Bladesmith Steve Schwarzer's new mid-tech line. He has crafted a skeletonized Tactical Dagger with a 4.5-inch blade cut from roll forged 80crv2 high carbon steel. 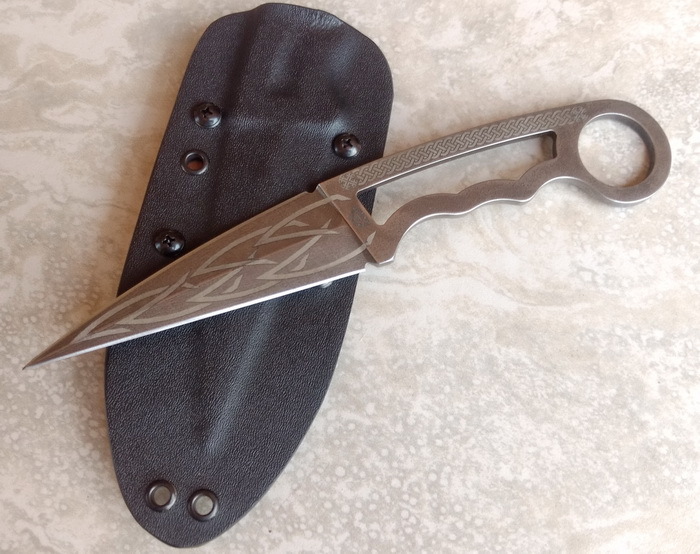 The blade and handle are stonewashed and laser engraved with a design developed by Steve and Matthew Genton. It is 9.375 inches overall and comes with a pancake style Kydex sheath also made in house.